Black rot, caused by the bacterium Xanthomonas campestris pv. campestris (Xcc), is a significant disease of cabbage and other crucifer crops worldwide. The disease was first described in New York on turnips in 1893, and has been a common problem for growers for over 100 years. The pathogen thrives in warm, wet weather, spreading from plant to plant by splashing water, wind blown water droplets, and by workers or animals moving from infected fields to healthy fields. Xcc can spread rapidly during transplant production in greenhouses or seed beds, and could be spreading long before any symptoms are observed. The bacterium can infest seed, infecting young seedlings as they emerge. The pathogen can also survive in cruciferous weeds, such as yellow rocket, Shepherd’s purse, and wild mustard, as well as in crop debris in the field. Figure 1. 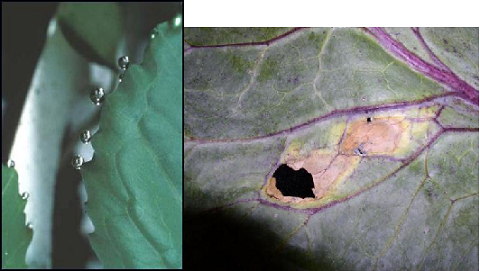 The cabbage above shows typical black rot symptoms, with V-shaped lesions moving into the leaf from the leaf margin. Photo credit: Chris Smart, Cornell University. Figure 2. Transplants with black rot symptoms are shown above. While these plants are clearly diseased, it is important to remember that bacteria can be invading plants even if no symptoms are observed. Photo credit: Holly Lange, Cornell University. All crucifer crops are susceptible to black rot, including cabbage, broccoli, cauliflower, Brussels sprouts, Chinese cabbage, kale, radish, turnip, mustard, rutabaga, watercress, and arugula. Figure 3. The cabbage field on the left has been destroyed by the black rot pathogen. Portions of the field on the right have been overtaken by cruciferous weeds which can serve as a source of inoculum. Photo credit: (left) Chris Smart, Cornell University; (right) Julie Kikkert, Cornell University . Symptoms of black rot generally begin with yellowing at the leaf margin, which expands into the characteristic "V"-shaped lesion. The bacterium commonly enters the plant through the hydathode, or water pore, on the margin of the leaf; however, damage to leaves due to insect feeding, hail, or mechanical injury can also enable pathogen entry. 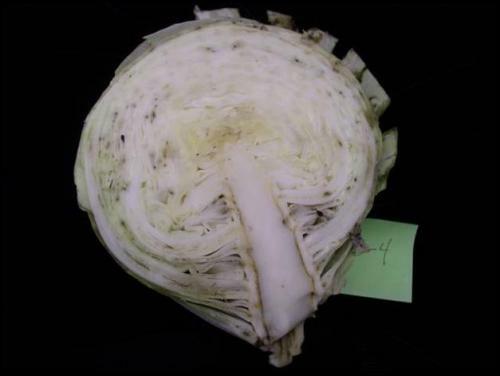 The bacterial infection becomes systemic, meaning that the bacterium can enter the veins of the plant and spread into the cabbage head, which can lead to serious losses in storage. Blackening of the vascular tissue is typical in severe infections. Figure 4. Hydathodes (or pores) on the margin of this cabbage leaf (left) exude plant sap or guttation droplets early in the morning. These hydathodes are the most common entry method for Xanthomonas campestris pv. campstris (which causes black rot). The leaf on the right is showing symptoms of black rot, with the lesion starting at the location of insect damage. Photo credits: Holly Lange, Cornell University. Figure 5. Internal vein blackening caused by the black rot pathogen. This head would rot completely during storage. Photo credit: Holly Lange, Cornell University. Start with clean seed – It is known that the bacterium that causes black rot can survive on and in seed. Hot water treatment can be used to destroy the bacteria that may be infesting your seed. If you have purchased seed that has NOT been hot water treated, you can treat the seed yourself, but it is critical to do it correctly. For cabbage and Brussels sprouts, soak seed for 25 minutes in 122°F water; for Chinese cabbage, broccoli, cauliflower, collard, kale, kohlrabi, rutabaga or turnip, soak for 20 minutes in 122°F water. Mustards, watercress and radish are more susceptible to heat damage, and should be soaked for 15 minutes in 122°F water. There is an excellent fact sheet on hot water treatment of seed at http://ohioline.osu.edu/hyg-fact/3000/pdf/3086.pdf . For additional information, see the eOrganic article Keys to Disease Management in Organic Seed Crops. Treat a small number of seeds the first time to ensure that the treatment is not reducing seed germination. Use clean transplants – If you are growing your own transplants, make sure that the greenhouse has been cleaned well prior to starting transplants—even if you had no disease last year! Bacteria have a remarkable way of surviving in weeds, organic matter, or nooks and crannies, so if possible, get rid of all weeds, use new or disinfected flats, and disinfect benches and tools prior to the start of a new season. Be sure to keep foliage as dry as possible, and do not brush or trim wet plants. Use pathogen-free organic starting mix, and if you are adding compost, be certain that no diseased plant matter was used. Rotate with non-crucifers – Because the black rot bacterium can survive in debris in the soil, it is important to rotate away from crucifer crops for a minimum of three years. Anything that can be done to reduce leaf wetness and water splash will help reduce disease spread. This includes watering plants in the morning so that leaves dry prior to sunset, maintaining your irrigation system to reduce the likelihood of ponding, increasing spacing between plants, and orienting rows with prevailing winds to maximize air flow and drying. Figure 6. Cabbage and cauliflower plants at this production facility are watered early in the morning so leaves will dry quickly. Photo credit: Chris Smart, Cornell University. As with most bacterial pathogens, managment can be very difficult when the weather is conducive to disease. Once a plant is infected, there is no rescue treatment since the infection is systemic. Copper-based products are effective in reducing spread from infected to healthy plants. NOTE: Before applying ANY pest control product, be sure to read and understand the safety precautions and application restrictions, and make sure that the brand name product is listed in your Organic System Plan and approved by your certifier. For more information see the eOrganic article Can I Use this Product for Disease Management on my Organic Farm? Although black rot can be severe, following the prevention strategies described above will reduce the risk of this disease. Although the pathogen can survive on farms, we know that this is not the most common source of inoculum on farms that use a minimum three year rotation; instead, the pathogen is most commonly brought onto farms on seed or plants. In New York, new strains of the pathogen enter the state each year. Thus, planting only clean seed and disease-free transplants are the most important management practices in regions with cold winters. In locations with mild winter temperatures, the risk of maintaining the pathogen on farms is greater. McGrath, M. T. 1994. Black rot of crucifers. Fact Sheet page 730.40. Cooperative Extension of New York State, Cornell University, Ithaca, NY. Available online at: http://vegetablemdonline.ppath.cornell.edu/factsheets/Crucifers_BR.htm (verified 20 January 2010). Miller, S. A., F. Sahin, and R. C. Rowe. 1996. Black rot of crucifers. Extension fact sheet HYG-3125-96. The Ohio State University. Available online at: http://ohioline.osu.edu/hyg-fact/3000/3125.html (verified 20 January 2010). Miller, S. A., and M. L. Lewis Ivey. 2005. Hot water treatment of vegetable seeds to eradicate bacterial plant pathogens in organic production systems. Extension Fact sheet HYG-3086-05. The Ohio State University. Available online at: http://ohioline.osu.edu/hyg-fact/3000/pdf/3086.pdf (verified 20 January 2010). Williams, P. H. 1980. Black Rot: A continuing threat to world crucifers. Plant Disease 64: 736–742.